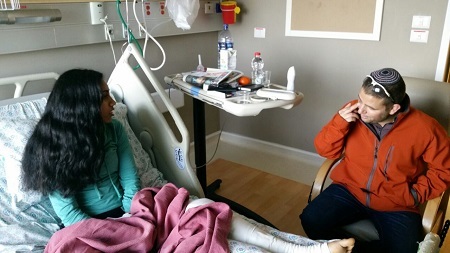 The condition of all four of the soldiers still hospitalized from the January 8 terror attack in Jerusalem is improving at Hadassah’s Ein Kerem hospital. Several have undergone surgery by Hadassah’s team of trauma orthopedists after the driver of the flatbed truck rammed them at high speed and then backed over them. “We are sadly experienced in these terror injuries,” said Prof. Rami Mosheiff, an international expert on orthopedic trauma and former Chairperson of AOTrauma, the European trauma association. Seventy percent of trauma from terrorism requires orthopedic intervention. Prof. Mosheiff is often consulted by experts abroad on how best to treat those who have been injured by bombs and vehicles. In photo: Liron, 23 and Shuki Gilboa.